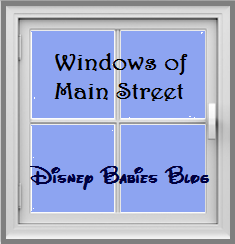 Disney Babies Blog: Window Wednesday! As many of you might have heard, Robert Sherman, brother to Richard (shown above with Mickey Mouse) and partner in the amazing Sherman Brothers music team, passed away Monday night at the age of 86. 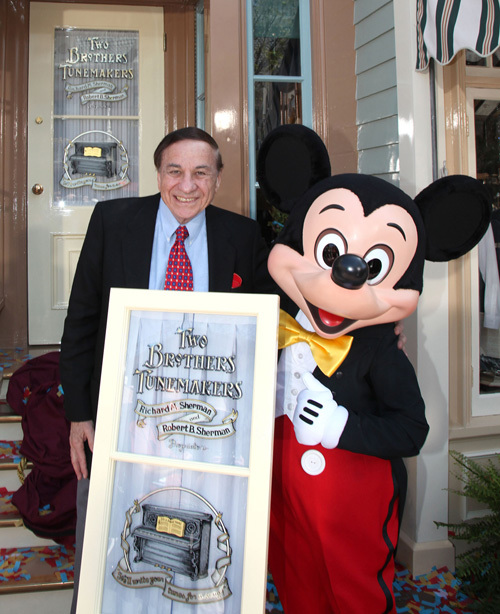 He and his brother were honored with a Main Street U.S.A. (Disneyland Resort) window in March of 2010. We've all grown up listening to the amazing music that these brothers created - both in film and in theme parks. Everything from the Carousel of Progress and Small World to Mary Poppins and the original Parent Trap (love!). What I learned from watching the documentary: "The Boys: The Sherman Brothers' Story" is that sadly, after so many years of amazing partnership, the two brothers were estranged in their later years. The documentary was an attempt by their sons to help reunite them, though I don't think their bond was ever fully resolved. Richard Sherman to this day still loves to be a part of the Disney community - performing at D23 conventions in the past few years and he's even scheduled to be a part of the WDW Radio Cruise this November (oh, how I wish I could go! ), while Robert lived in London, dedicating a life to painting, instead of the music career he fell into in his younger years. I can't imagine not knowing the words to Supercalifragilisticexpialidocious (even though I can't spell it!) 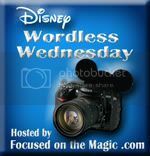 or a Small World - or even "It's a Great Big Beautiful Tomorrow" at the Carousel of Progress. Next time you're at WDW waiting for the CoP, watch the video of Walt singing that very song with 2 men - those are the Sherman Brothers. Thanks Jenn, for such a beautiful tribute to Robert Sherman! What an amazingly multi talented legend!! You are so right. They made such an impact on our childhoods. That's a nice tribute, Jenn! I'll watch for that video. Never caught it before...but I don't think I've ever had to wait on Carousel of Progress. What a great post - thanks for including the video clip, that made my day! ;-) Wow... so much talent to have written songs that inspire so much hope and happiness. Great work, I really enjoyed this post! Great tribute. My childhood would have been so different without them.